I never considered myself a health nut before. I eat way too many desserts, sit a lot, and struggle to drink half the recommended amount of water per day. However, I do try my best to make decisions that are good for my body and the planet. I have been more-or-less vegetarian for the past 7 years and close to completely vegan for a year. I also dabble in adaptogens, collagen, supplements, and try to make eco-friendly decisions. For those reasons, I’m very interested in how health influencers (Lee’s blog is one of my faves) pack and the tips they share related to traveling in a more healthy way. 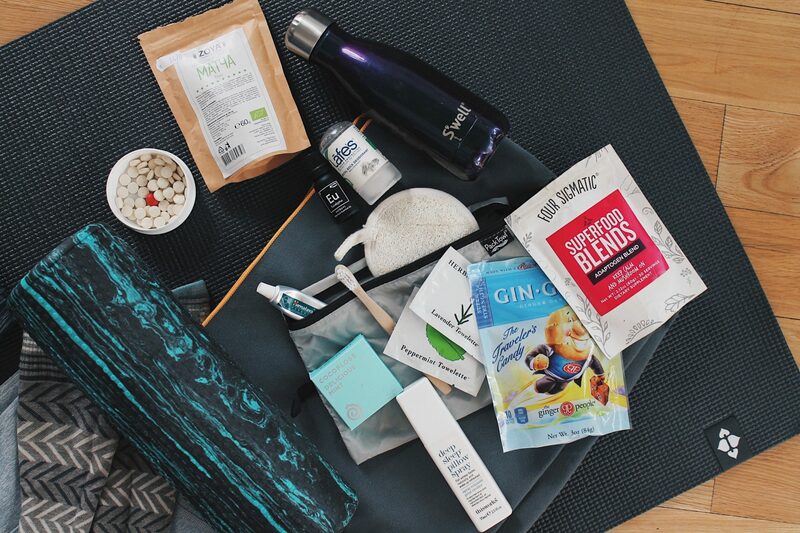 If you’re looking to inject more wellness into your travel routine, here’s my packing list for the health-conscious traveler. When choosing your toiletries, look for all-natural items in the health-food section of your grocery store. Wellness bloggers also love self-care rituals, so you can experiment with dry-brushing with a travel-sized loofah and using aromatherapy to calm, energize, or focus your mind while traveling. PS. Most of these can be found at Well.ca. Get $10 off your purchase of $40+ by using the code HealthyCapsule. To ease an upset stomach, bring ginger candies or ginger + melatonin tablets. You can also bring your own beverages in powder form. My favourites are matcha powder when my stomach can’t handle any more bad coffee and a convenient pre-mixed adaptogen blend. You’ll also want to make sure you choose your plane snacks wisely. A health-conscious traveler also cares about the impact of prolonged sitting on their body and therefore actively stretches. That’s why no list would be complete without some workout wear and accessories.